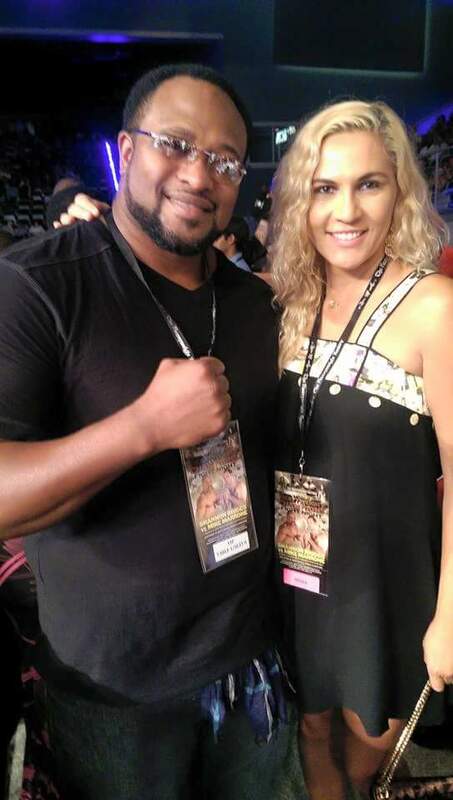 Cindy “Boom Boom” Podgorski and I recently had the pleasure of meeting up with Lamon Brewster at the Hard Rock Casino in Hollywood, Florida. My introduction to the heavyweight prize-fighter was back in 1999, when I was a journalist and editorial associate for Puff Daddy’s Notorious magazine. The particular assignment that brought the pug and the penman together was a piece called “Stars and Cars” and it entitled me the opportunity to interview such names of the day as Carmen Electra, New York Nets Star Jayson Williams, comedian Bill Bellamy, actress Sali Richardson, racing scion Antonio Sabato Jr. and some boxing up-and-comer named Lamon Brewster. How could I not dig this dude? Lamon’s story, however, came with a celebrity side-bar; his manager was Hollywood hotshot producer/writer Sam Simon (co-creator of the then super hot The Simpsons television show). “I was training at Freddie Roach’s Wild Card Gym in Los Angeles at the time. I made no secret of seeking a manager and so one day this guy shows up and he’s chatting me up but I had no idea who he was. I’d arranged an after-party for Lamon at Puffy’s restaurant Justin’s. I remember Conan O’Brian (a close friends of Sam) showing up to celebrate “Relentless” and his victory over Richard Mason. I continued to follow Lamon’s career and was full of trepidation when he got his big shot against Wladimir Klitschko for the WBO Heavyweight belt. I called it an epic upset but Lamon took exception to that description. I had to know at what age he “knew” he’d be a champ and Lamon was quick to spin the following yarn. “When I was around 7-years old I remember waiting up to watch ESPN so I could find out who won the Hagler/Leonard fight. I was a big fan of Marvelous Marvin because he wasn’t showy—a blue-collar fighter—a man who did his talking in the ring. “When they announced that Leonard had won I was crest-fallen. I clearly remember having an out-of-body experience—seriously. My spirit rose from my body and told me that I would become a World-Champion! Lamon went on to explain to Boom Boom and I that the prayer had become something of a mantra and that even after he’d actually won the title he’d catch himself still asking for what had already been granted—the Championship Belt. That title bout was in 2004 and it wasn’t until two years later in 2006 that I next saw Lamon in person. The bout was in Cleveland, a Don King Production. Lamon was facing hard-hitting Siarhei Liakovich. Lamon told us that it was a fight he’d tried to postpone. He wasn’t in the best of shape due to an eye injury suffered in camp—but a deal is a deal and he went in nonetheless. Needless to say, it was a brutal battle of attrition with both fighters pounding away, round after round—Liakovich got the decision—Lamon a detached retina . After a long session of reminiscing and ruminations Boom Boom and I inquired about Lamon’s current status and he didn’t lose a step of his positive animation—crowing of his latest project. “I’m working with Al Haymon and some ex-champs including Buster Douglas, James Toney and Chris Byrd. We’re training amateur boxers, each from our home states—attempting to get them off the streets and into the gym.